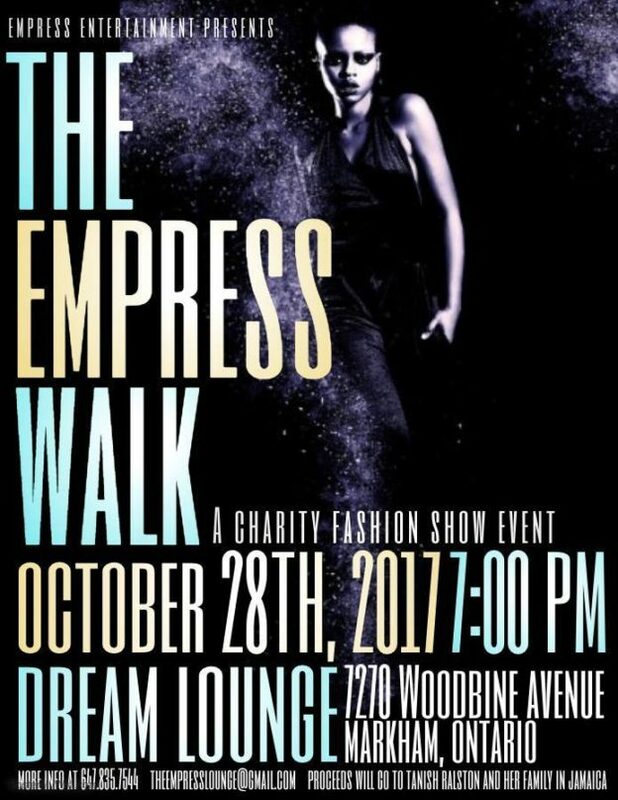 FBI STYLE is an official sponsor of The Empress Walk Charity Fashion Show Event taking place at the Dream Lounge in Toronto on Thursday October 28, 2017 in an effort to raise funds for a young woman supporting her mother undergoing cancer treatment in Jamaica. “We’re in a phase of building relationships and creating great content so working with Empress Entertainment to promote this event felt like a natural fit,” says Sandra Gabriel, editor of FBI STYLE. “Also, seeing my own mother heal from breast cancer, I have really become compassionate to those who do not have the same support or access to resources like my mother and many other cancer patients,” adds Gabriel. This year, The Empress Walk aims to make a positive difference by raising $2,500 towards the purchase of a prosthetic leg to increase one cancer survivor’s mobility, independence and overall quality of life and they are also acquiring necessary medical supplies to send to a local hospital in Jamaica. Empress Entertainment emphasizes that October is the month for cancer awareness and a time to remember individuals and families affected by cancer. One such person is Tanish Ralston, a young woman originally from Jamaica now living in Canada, whose mother has been battling the disease for some time. Ralston’s mom recently had surgery to remove one of her legs in order to prevent the spread throughout her body. Giselle Wilson, co-founder of Empress Entertainment comments that Ralston and her family are facing financial challenges and she is limited with her ability to support such an extra-ordinary circumstance with her family back in her home country. The birth of The Empress Walk came about through one heart-felt conversation between Ralston and Wilson. Soon after, Wilson and her husband agreed that they would help Ralston by coming up with a way to raise funds and sponsor a prosthetic leg for her mother and also create a platform that would educate people about cancer and celebrate women, their beauty and health in an impactful way. “We are answering the call and are hoping to collaborate with others who will do the same by giving liberally and directly to participate in this worthy cause,” says Wilson. “Responding to the desires of our clientele and community, namely Tanish and her mother, we aim to provide direct support to those in need through a signature event that celebrates life, longevity, confidence, beauty and the human spirit,” she adds.